Daily Sadhana is a unique online service for spiritual seekers. Acquire spiritual knowledge anywhere, anytime, and at your own pace! 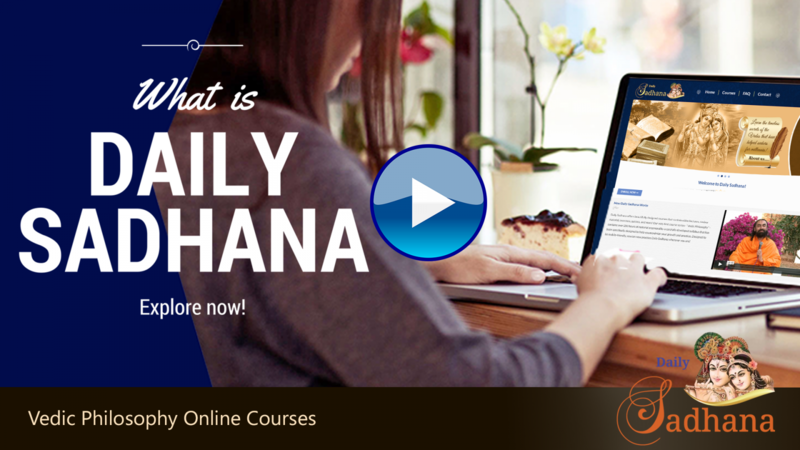 Listen to engaging video lectures, exclusively recorded for Daily Sadhana! Practice what you learn through special guided meditations! Test your knowledge through exercises and reviews! Mobile friendly and accessible from all major platforms! Begin your Daily Sadhana journey with Fundamentals of Vedic Philosophy course, that allows you to take Secrets of Vedic Philosophy and Advanced Vedic Philosophy. Learn the timeless secrets of the Vedic literature. Daily Sadhana has been designed to allow users gain the maximum benefit from this program. It is rich with features that provide an optimal learning experience and makes learning enjoyable. Swami Mukundananda is a renowned spiritual teacher from India, and senior disciple of Jagadguru Kripaluji Maharaj. He is the founder of the holistic Yogic system called “Jagadguru Kripaluji Yog”, widely known as JKYog. The 1% Rule! A little change on a daily basis makes a tremendous transformation in the long run! If we could transform ourselves just 1% every day, after a few months, we would have changed ourselves 100% percent. Is Daily Sadhana Right for Me? Daily Sadhana is both structured and engaging, systematic and entertaining, organized and fun. It removes the obstacles to learning profound philosophy and practicing spirituality regularly - hence enabling you to make solid and continuous progress every single day! Daily Sadhana equips you with the knowledge and practical skills that you need to develop yourself internally, reduce stress externally, stay balanced through all of life’s ups and downs, and overcome the negativities that plague the human mind. “Who am I? What is my place in this world? What am I looking for?” If you have been searching for answers to life’s great questions, Daily Sadhana is right for you. Learn from the ancient Vedic literature that has inspired many of the greatest philosophers of the world. If you have a sincere desire to progress spiritually and cultivate love for God, Daily Sadhana provides you with the theoretical and practical tools that you will need. The structured nature of the courses allows you to make continuous and systematic progress every single day.